Instead of getting stuck in a rut of "boring" on the Whole30, I've been trying my best to use it as inspiration to get creative. This is my 5th round, and let me tell you~ mixing up your food choices is key to making it through the whole month. Don't let food boredom get the best of you, and leave you longing for pizza or sushi or chocolates or takeout... make something fun! 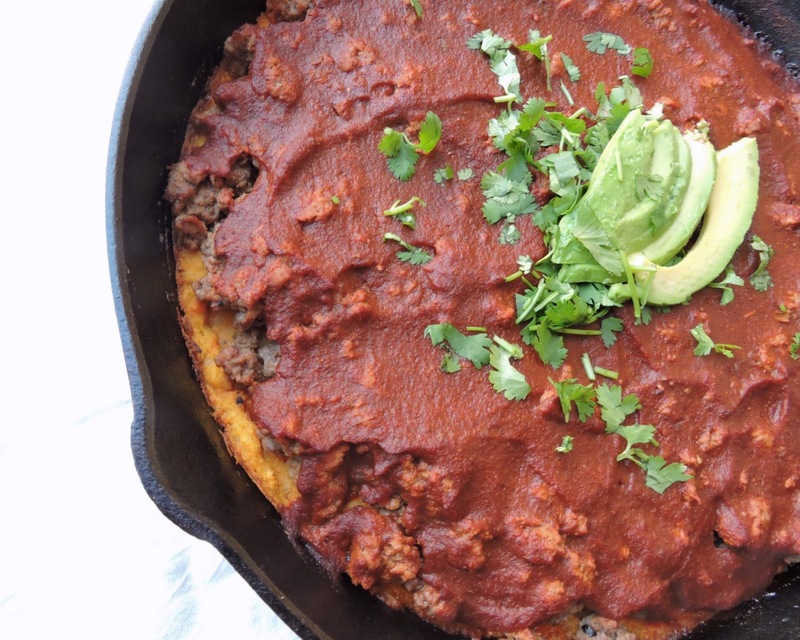 This is my play on a "Tamale Pie". It has all of the flavors I love from the good ol' Costco tamales we used to buy in bulk & inhale, but the ingredients are awesome. 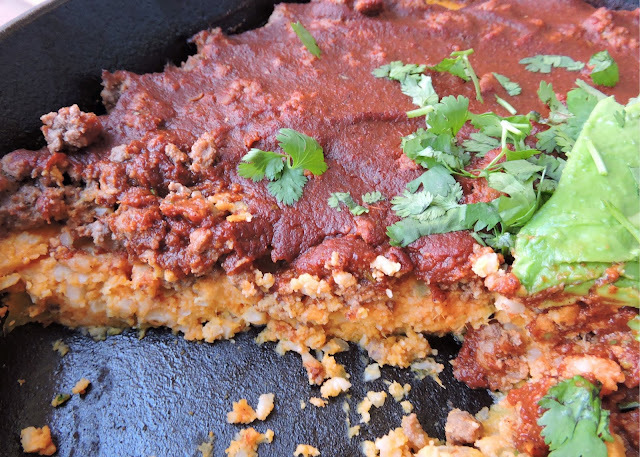 The crust has a sweet, "masa" or cornbread-like flavor made from simple, grain-free ingredients: cauliflower & sweet potato. The sweet potatoes give the whole dish a natural sweetness, and contrast perfectly with diced green chiles for a mild kick of heat, with riced cauliflower for a little texture. Topped with savory ground beef, and a rich red sauce, this dish will seriously melt in your mouth... it's so flavorful! It's also Whole30 approved... and I can't wait for you to try it! If you tolerate dairy, try it topped with a little grass-fed cheddar. We also added plenty of cool avocado, chopped cilantro, and a squeeze of fresh lime for extra flavor. Feel free to double the recipe if you're extra hungry or feeding a crowd, and enjoy! Feeds 4-6, depending on your appetite. Cook the sweet potatoes until soft*, slice in half, and scoop out the flesh into a medium mixing bowl. 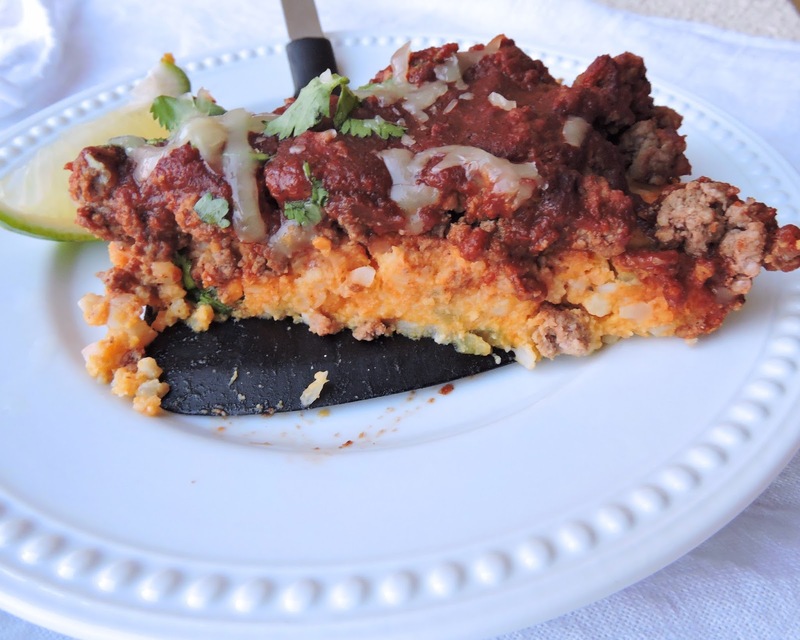 Combine with cauliflower rice, diced green chiles, eggs, flour, salt, and pepper until smooth. Grease the cast iron skillet or baking dish with your cooking fat of choice, then scoop the crust mixture into the dish~ spreading evenly over the top. Bake for 25 to 30 minutes, or until the edges begin to brown. Meanwhile, in a large pan, sauté the ground beef with spices until browned. In a small bowl, combine the sauce ingredients and set to the side. Feel free to add a little water or broth if you prefer a thinner sauce. 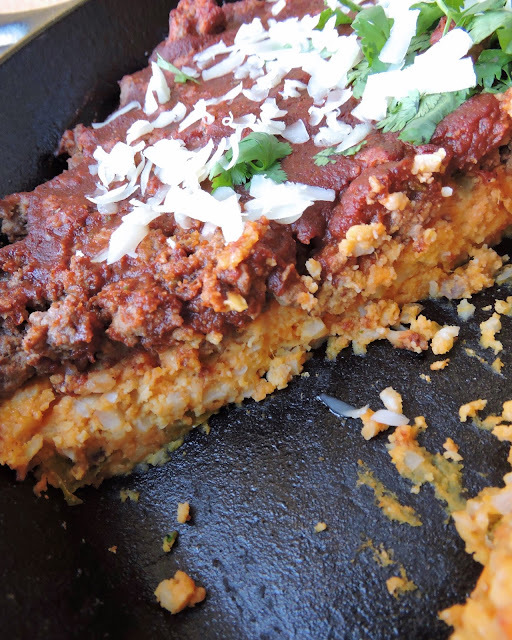 Remove the crust from the oven, then top with the spiced ground beef, followed by the red sauce. Top with a little shredded grass-fed cheese if you like, then return to the oven and bake for 10 more minutes to heat through (the sauce will begin to bubble). 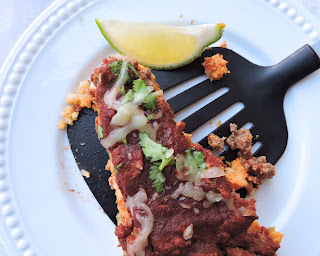 Allow your "Tamale Pie" to cool for a few minutes before slicing & serving~ topped with garnish of your choice. Enjoy! I used coconut flour, but any Paleo-friendly flour would work (almond, arrowroot, cassava, etc). It's just to absorb a little moisture. For the sweet potatoes, you can steam, bake, or boil. We typically steam ours in the microwave for 3-4 minutes on each side, wrapped in a damp paper towel with a few holes poked in them. Quick & easy! I made this dish tonight and was not disappointed - it was a deliciously savoury feast and I can't wait to have the leftovers for lunch tomorrow. I made this tonight. Another delicious recipe. I made it in a 9 x 13 with 6 large portions. This one is a keeper. Anything to substitute for eggs? Do you have the nutritional info for this recipe? Thanks!